The crafts market has blown up in recent years, and while many books on knitting clothes exist, there are few about knitting as it relates to interior décor. With the impending holiday chaos, a knitting project may not be first on your list. But a holiday knitting project? Yes, please. Mary Jean Daigneault, an interior designer and a knitter herself, wisely decided to merge her skills in order to serve this particular niche. In Holiday Boutique Knitting: Inspired Holiday Décor and Gifts to Knit, Daigneault includes over two dozen patterns for holiday decorations and gifts, including hats, pillows, advent calendars, and giant snow people. Chapters cover Christmas décor, home décor, stockings, wreaths, evergreen trees, apparel, and stocking caps. Each has a brief project description, including a breakdown of the exact materials one will need for every object, such as needle sizes and types of knitting materials. Instructions for some of the more complicated knitted items, such as two-foot-tall snowmen, are broken down into bite-sized pieces—for example, the hat, vest, nose and scarf for “Mr. Snow.” In addition to detailed descriptions, Daigneault includes tips such as how to decorate a Christmas tree: “If you get stuck, think of the perfection nature offers and try to reproduce the beauty we find outdoors. Trees, like anything else, are designed to have some reoccurring elements.” She also offers tips on spicing up your house for the holidays, by swapping out everyday items and replacing them with holiday themed pieces, such as a giant, red stockinette-stitch pillow. The final chapters include a list of sources for obtaining the supplies listed for each project and a handy dictionary of stitch terms such as bobble, chain stitch, and I cord and descriptions for those who need a refresher course on the abbreviations. 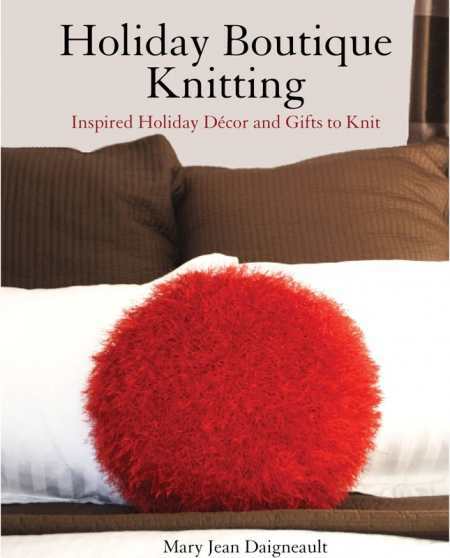 This is a well- rounded book on knitting holiday décor, a welcome addition to any knitter looking for a way to step up the Christmas spirit by adding warmth to their home.